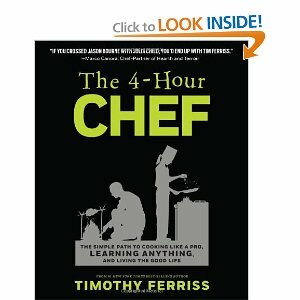 The 4 Hour Chef is my new favorite book! I love both the science & art of the culinary world and this book does them both major justices. This is the book I wish I had when I embarked on my food education! Not only does Tim Ferriss do a wonderful job “teaching” basic cooking skill he does much more, he teaches you how to learn! With the mindset and lessons between the pages of this tome you could & should learn to feed yourself and ENOJY feeding yourself as well as almost any other aspect of life! I cannot recommend this book enough! Buy the book, learn to feed yourself, learn to enjoy feeding yourself & loved ones and learn how to learn!